Filed to: How much would you pay for thinness?Filed to: How much would you pay for thinness? How much would you pay for thinness? There are always going to be people who want a big, powerful laptop. I’m talking about people like developers that want to show off early game builds at trade shows or stubborn people who simply can’t compromise on performance when they are away from home. But is there any benefit to turning these 17-inch behemoths into something that thin and light too? 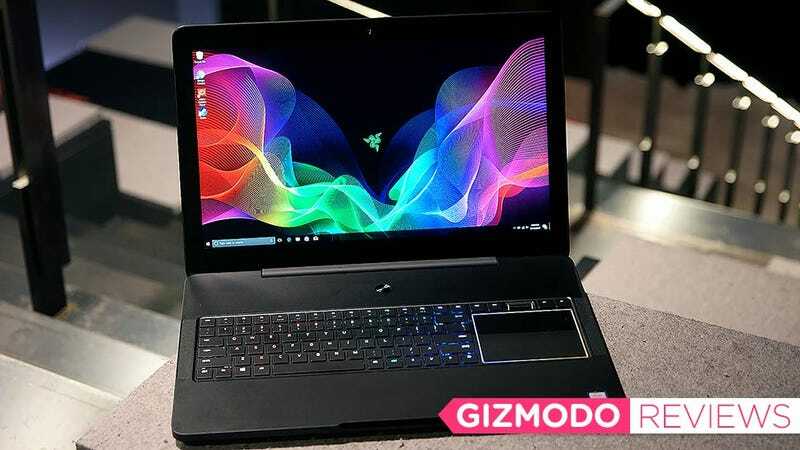 For years, that’s exactly the point Razer has been trying to make with its 17-inch Blade Pro, which packed desktop-level specs in a surprisingly thin body. But with prices that hovered near $4,000, that question was largely academic, since you’d have to be independently wealthy to actually buy one. 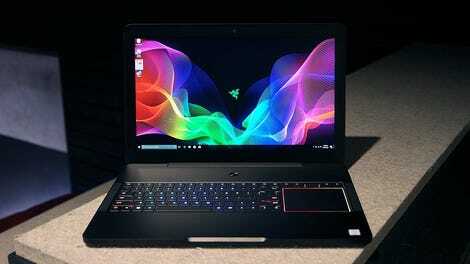 But now, Razer has trimmed back some components to create the least expensive 17-inch gaming laptop the company has ever made, which makes the idea of a thin-and-light 17-inch gaming notebook finally a topic worth investigating. An unusually thin 17-inch gaming laptop. RGB keyboard lighting and it’s really thin, did we mention that yet? You’re paying a huge premium for that thinness. That said, starting at $2,300, the Blade Pro still doesn’t seem that cheap, and compared to other 17-inch devices it isn’t. Like the $3,800 fully-equipped Blade Pro, this model has a solid aluminum unibody chassis that measures just 0.88 inches thick, which is almost 40 percent thinner than a traditional 17-inch system like the 1.43-inch thick Lenovo Legion Y920. But even with that kind of thinness, the Blade Pro’s 6.8 pound heft and sheer dimensions mean this still isn’t something you can just casually toss in a bag. In fact, the Blade Pro doesn’t even fit in the messenger bag I carry every day, or any of the other shoulder bags I own besides my cavernous camping backpack or the rolling suitcase I use when traveling. That means I’m forced to buy special gear just to haul this thing around, which makes it just as cumbersome as other 17-inch systems with much bigger waists. This is purely thinness for thinness’ sake. Instead of a 4K display, this new model sports a big full HD screen with good peak brightness (360 nits) and a handy matte coating to prevent distracting reflections from messing with your games. You also get a healthy number of ports including one USB-C jack with support for Thunderbolt 3, HDMI, Ethernet and even an SD card reader. And since its Razer, you get a chiclet keyboard with some of the most colorful and best looking RGB backlit keys on the market. One of Razer’s departure from the typical laptop formula involves moving the touchpad to the very right side of the system, instead of below the keyboard like you’d normally expect. This is something that takes some getting used to as countless laptops have taught me to instinctively reach below the spacebar when I need to make a quick cursor gesture. I was able to adjust in less than a day. which makes the touchpad’s location more of a quirk than a real con. But if you’re thinking that placement means you might be able to simulate the traditional mouse and keyboard arrangement with your left hand on WASD and your right on the touchpad, think again. Even with a huge 4 x 3.25-inch surface area, no touchpad is good enough to sub in for a actual mouse. I really wish I could have found more uses for the scroll wheel than I actually did. Then Razer spices things up even further by adding a physical scroll wheel that can be reprogrammed to a number of different functions using the company’s Synapse software. But the weird thing is that even though I was really looking forward to using it, I actually found that most of the things I actually wanted to use it for, like volume control or scrolling, have already been taken care of with function keys or touchpad gestures. That makes the wheel kind of redundant. As for the Blade Pro’s actual gaming cred, its performance falls right in line with what you’d expect from a something with an Intel Core i7-7700 HQ CPU, 16GB of RAM, and a Nvidia GTX 1060 GPU. In Rise of the Tomb Raider, the Blade Pro hit 82 fps on high, and 55 fps on high in Civilization VI. That should give you the confidence to play pretty much any modern AAA title on settings high enough to please. However, at the same time, I’d be remiss to mention that gaming laptops that cost north of $2,000 normally include an Nvidia 1070 or 1080 GPU, which offer 20 to 40 percent better graphics performance. Another nice thing about the Blade Pro’s big chassis is that you have you enough room for two storage drives, which means you get a 256GB SSD for storing your OS, apps, and games, and a 2TB HDD for all your extra media. Ethernet! Now that’s a port you see don’t see that much anymore. Now it probably won’t surprise you to know that the Blade Pro’s battery life is pretty bad, as it lasted just 4 hours and 10 minutes on our battery rundown test. And if you plan on doing any sort of gaming without plugging in the power cord, that times shrinks down to an hour and a half or two at the most. But in the end, the thing I don’t get is that for almost $500 less, you can get the $1,850 14-inch Razer Blade, which has the same great build, CPU, GPU and RAM in a body you might actually want to move around. Both systems even have the same screen resolution, and for my money, the smaller Blade is the one I’d get. Sure, the bigger 17-inch Blade Pro has a few more ports and its bigger screen gives you a more room to work and play with. But let’s not forget, you can take the $450 you saved on the 17-inch Blade Pro and spend it on a nice desktop monitor, a big external drive, and still have a bit of cash left over for some games. There’s a reason Apple stopped making 17-inch MacBook Pros; the balance between performance and portability just isn’t there, even on a chassis this thin. And at $2,300, the “cheapest” Blade Pro’s value proposition is pretty poor too. Unlike the smaller Blade Stealth, the Blade Pro can’t use its USB-C port for charging. If you’re still deadset on a 17-inch gaming laptop, you’re much better off going with a thicker system that can accommodate more powerful components without raising the price to almost $4,000. You could even splurge a bit and opt for something like the MSI GT75 VR, which at 2.3-inches thick and weighing more than 10 pounds, is an absolutely monstrous system. But it’s performance is equally beastly and with a starting price of $2,700, its a much better option for people looking for top-notch specs. I appreciate that Razer’s laptop pricing is moving in the right direction, and the idea of having a big screen laptop with a luxuriously thin body is nice, but the number of extra Benjamins that you have to shell out to get it still seems a bit too high. The Razer Blade Pro costs $500 to $800 more than thicker 17-inch systems with comparable specs. The offset touchpad takes a bit of getting used to, but the RGB backlit keyboard is very pretty. For starting $2,300 Blade Pro features an Nvidia 1060 GPU, but if you want to upgrade to the model with a 1080 GPU, it’s going to cost you an extra $1,500. The Blade Pro’s four hours of battery life are pretty standard for a system this size, but that number shrinks to two hours or less if you are actually gaming on the go.